Tuesday I let you know that I'm no longer a Beachbody coach, and warned you that some changes would be coming ... so as promised I'm telling you about them! The first big change is that Shelby will be starting school ... HOME school that is. I won't go into my reasonings and musings, (because there were many and I feel like it is a very individual decision) but we've decided to start parent-lead A Beka K4 Cursive curriculum in September. Ok, I lied. I'll tell you a little about why I picked it. It is Bible based, I wanted to teach cursive, we wanted a curriculum at least starting out. Let's face it - sometimes I get a little scatter-brained and I didn't want to wake up one day gasping for air with my blood in my toes because we never went over punctuation. A Beka isn't new at this, and I've known several people with at least some degree of A Beka education along the way. They also have streaming academy and DVD education materials available were we ever to decide parent-lead wasn't going well. If you are thinking about homeschooling ... I recommend talking to adults who were homeschooled, parents who are at various stages of homeschooling, kids who are still in homeschool, kids who have done homeschool and more mainstream education routes, order brochures from various publishers, etc. It's overwhelming at first because there is so much out there ... but you have choices because there is so much out there! Now, about the changes to my writing. 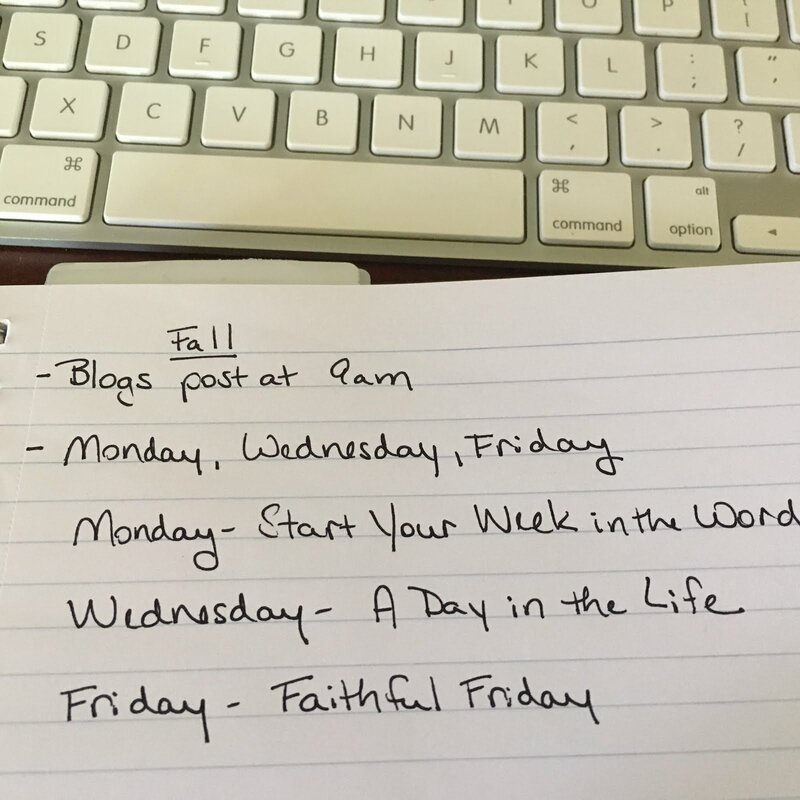 Just after I had decided I wanted to focus more on my writing than on coaching, I realized that my current self-imposed writing schedule some weeks creates a little too much of a deadline for myself. Most of my writing ends up being for my blog rather than just for practice, for fun, or room for any other pursuit the Holy Spirit sends me on. I've been terrible about editing ... I'm afraid you've been receiving some ugly raw material at times. I'm all about being genuine ... but to be a true writer I really need to sharpen what I have to offer before I put it out there. I can't tell you how much I appreciate the feedback to my survey! It helped me make some decisions and provided further confirmation of what I felt the Holy Spirit was leading me to do. Y'all surprised me with the days of the week you prefer to read! I honestly thought Friday was a pretty slow day, but perhaps more of my "hits" on Friday coincide with actual reading rather than robots and ramblers who end up here by accident. Y'all also tend to prefer to read a little later than I expected (though I give props to my fellow early birds!). So I'm going to push my publishing time later in the morning. That also actually buys me some time if I feel like something needs a little polish in the morning light with fresh coffee in my veins. Devotionals were never on the chopping block ... that is the direction God has been leading me and I want to stay on course with Him. It was VERY interesting to see that they ranked as most beneficial but also least enjoyable. Trust me - I understand. Sometimes I don't really want to say the things I feel God leading me to say! Lord, Lord that's going to sting! Are you sure you want me to say that? Don't we want people to LIKE my blog? Can't I just keep that to myself? And I'm so glad y'all enjoy hearing about our family. I love writing about them. I've had to change "what Shelby said" to "what Victoria said" so often that I'm going to take a lovely suggestion that was given and set apart a day for "A Day in the Life." A little bit "anything goes" but always coming back around to family. Some of you said I write too much, and some of you said I'm short and sweet ... so I'm just going to keep letting God lead me on that one. I've also started the Compel training offered by Lysa TerKeurst of Proverbs 31 Ministries. I'll save the story of how I ended up here for another time, but let me just tell you that God made this one a "no brainer" (in Tim's words). I'm excited to see where being faithful to God's calling will take my writing! I'm starting with some basics they've outlined, and there are even cute little blog stickers for when I complete them - so you should be seeing some of that in the coming weeks! I gave you a picture of my schedule earlier so you didn't have to wait, but your reward for sticking with me through all this is further explanation. All posts will go live at 9am from now on. Wednesday will be for family ... A Day in the Life ... cause I feel like we are living the LIFE! For a while I didn't think this would ever be my life and I am SO thankful for the craziness that it is ... homeschooling, funny stories, sad stories, parenting aha moments and horror-filled realizations, you name it. So I'm sure there will be plenty of what these two silly gooses said. Friday - End Your Week Well ... I'm going to focus on more nurturing, "positive", edifying messages for Friday to give you a little boost going into the weekend. I know sometimes the things God gives me are convicting and heavy... I'm praying He will let me show you why I love Him so much, and how I know without a doubt He loves us so much, on Fridays. As you can see, my writing is always a work in progress (catch the different between one of the pictures and my actual schedule?). I'm so thankful to the Father for this gift and so ready for whatever He is planning to do with it. Lord, please just use this in a way that is glorifying to You and You alone!